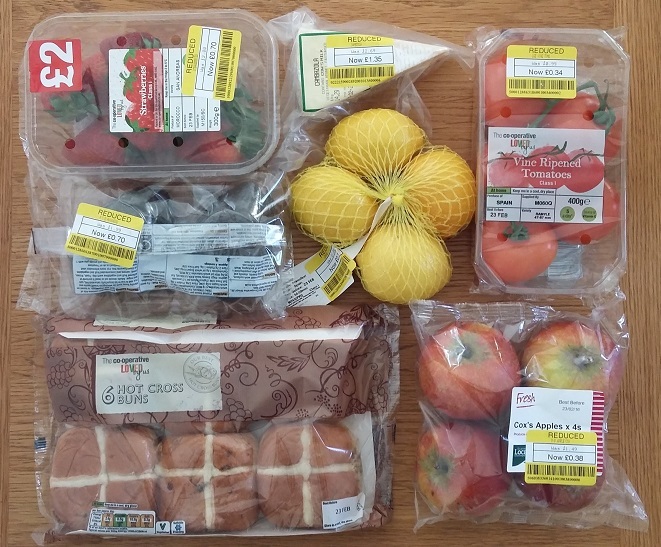 During February, I had the grand plan of trying to spend less while eating more healthily. Yet I started the last week of February raring to get to the shops. Why? Because during half term we had cleared our kitchen of virtually all fresh food, and I was keen to fill up on fruit and veg. 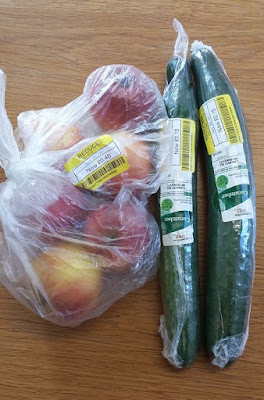 However, I still wanted to keep an eye on our food costs, and delayed any supermarket shopping until Tuesday evening. This meant I started Monday morning with banana-free porridge (run out of bananas), ate soup from the freezer with leftover dahl and a defrosted brown roll with cream cheese for lunch, returned to the freezer to feed the children (fishfingers and the last of some frozen mixed veg, plus potato wedges from the bottomless sack) and then used leftover roast chicken and chicken stock from the freezer to make chicken and (frozen) pea risotto with cherry tomatoes and cucumber as a side salad (run out of lettuce). After poached eggs for breakfast on Tuesday morning (run out of milk), I even made a quick trip to the library after the school run, in search of recipe inspiration for the remaining ingredients. This meant I could make a shopping list focused on the last few meals to get us to the end of February. After making my shopping list, I nipped into the Co-op before the main trip to Morrisons, and was delighted to find several of the items in the reduced sections, like apples, lemons and hot cross buns. Plundering the yellow-stickered stuff meant I could load up on more exotic options, from strawberries to vine-ripened tomatoes, avocadoes and even Cambazola blue cheese. At full price, it should have cost £11.07, rather than the £4.32 I spent. Later in Morrisons I was still keen to include more variety, and came away with red cabbage, butternut squash and taramasalata for a change, as well as staples like milk, bread, yogurt, cheese, eggs and tinned tomatoes. I tried to avoid further spending, but did pick up some odds and ends at the Co-op during the rest of the week – reduced apples and cucumbers (75p), a reduced yellow pepper and some reduced cubed lamb for a celebration meal (£2.58) and a couple of big bottles of milk (£2). On Sunday we went out for the paper, and splashed out 50p on a packet of Jaffa cakes as rampant bribery to encourage the children on a country walk. 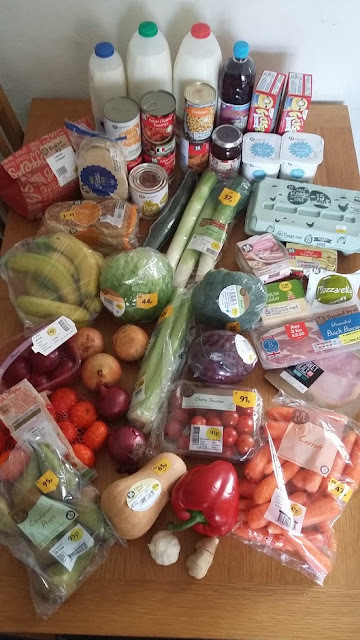 In total, our food spending in the final week of February came to a bit higher than I’d hoped, at £41.48. 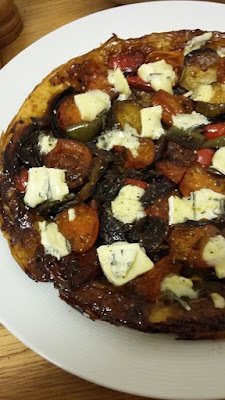 At the start of the month, I made a hit list of the ingredients pushed to the back of the store cupboard and lingering in the freezer (post here). 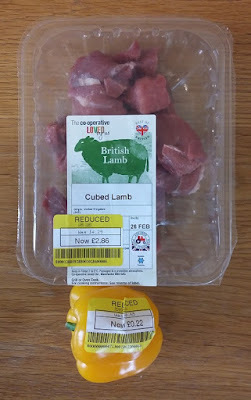 In the final week I made a concerted effort, and used the chicken stock to make risotto and cous cous to accompany tagine made with the cut-price lamb. The real success was using up the leftover mincemeat to make flapjack (highly recommended, although admittedly not the healthiest lunch…). Unfortunately my second attempt at dahl, using some of the yellow split peas, was nowhere near as nice. We demolished the final remains of the Quorn mountain by using the chicken pieces in a stir fry with noodles (I liked it, the kids were less keen) and eating the sausages with mash and red cabbage one lunch time. I was also glad to use up the end of a packet of borlotti beans (sausage casserole) and odds and ends of frozen veg in the freezer. The general themes in our final week were stretching the remains of the enormous chicken, and using up as much as possible for everything else. The bargain chicken I couldn’t resist buying the first week ended up making multiple meals. It started off as a Sunday roast for the whole family, but there was enough left to make chicken risotto the next night for my husband and me, and a chicken pasta bake a couple of nights later, with a portion for a packed lunch afterwards. It also came in handy for other packed lunches, once as cold chicken with leftover mash and veg, and once as a chicken sandwich. So in the end the single 1.8kg chicken formed the basis of meals for 11 servings. One of the highlights was the roasted veg tarte tatin, pictured at the top of the post, eaten with a green salad. It used up the last of a packet of puff pastry and assorted veg, and the yellow-stickered Cambazola gave it a real lift. We also ate some slightly strange meals – the whole family ended up eating fishfingers, wedges and beans one night, and one of our last lunches involved a ham sandwich for my son, a cheese sandwich for my daughter, the last carrot, cumin and kidney bean burger for my husband, and the Quorn sausages with leftover mash and red cabbage for me. We finished the month with veggie curry, as a way to use up elderly cauliflower with some carrots, onion and the last of a jar of Patak’s curry paste. More virtuous than delicious, I reckon. Anyone else had any triumphs or disasters when using up ingredients from the back of their cupboards, fridge and freezer?